In this chapter the Psalmist summons all nations on earth to join Am Yisrael in exalting the greatness of the Almighty. The praise sung to God consists of two primary themes: His dominion over all people throughout the entire earth (verses 3, 8,9), and His special relationship with Am Yisrael, whom He had led to victory over their foes and returned to their homeland (verses 4-5). The commentators thus explain that this chapter refers to the Messianic era, when Israel will be delivered from its oppressors and return to its land, and all nations on earth will recognize the truth of God. 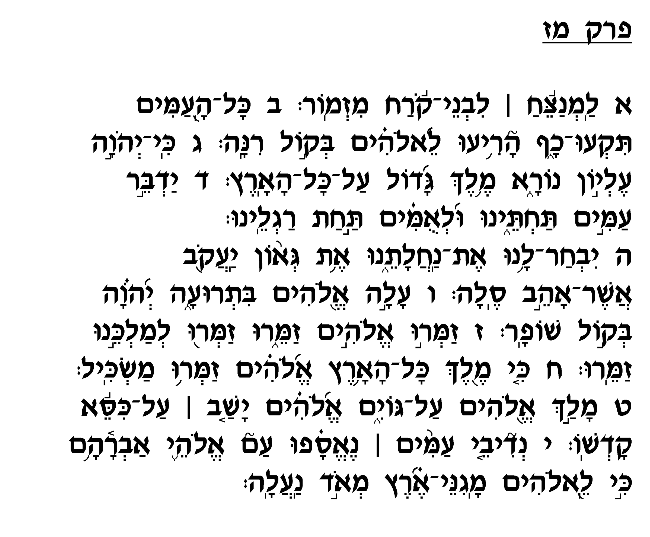 This Psalm's final verse tells of the "Nedivei Amim" who gather to declare God's kingship. Whereas most commentators interpret this term as a reference to dignitaries of foreign peoples, Rashi claims that it is derived from the root "N.D.V.," which means "volunteer." According to Rashi, the Psalmist speaks here specifically of the Jewish people, who are known as the "volunteers of the nations" in that they have always been prepared to sacrifice even their very lives "Al Kiddush Hashem," to bring honor to God. Those who have made such painful sacrifices on behalf of the true faith will be invited to lead the celebration on the day when this faith will once and for all be affirmed throughout the world and recognized by all nations. 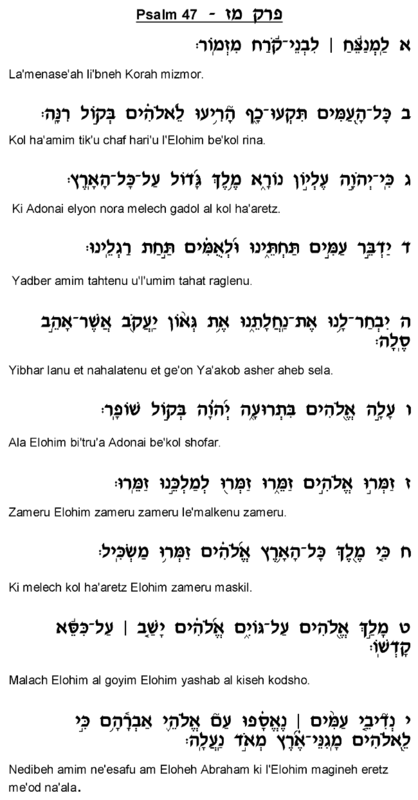 Many communities have the custom of reciting this Psalm prior to the sounding of the Shofar on Rosh Hashanah. The most obvious connection between this chapter and the Shofar is verse 6, which declares, "God has arisen with a [Shofar] blast; Hashem with the sound of the Shofar." It emerges from this verse that the Shofar blast serves as the symbolic proclamation of God's ascension to the Heavenly throne, which is indeed among the central themes of the Mitzva of Shofar blowing on Rosh Hashanah. More generally, on Rosh Hashanah the Jewish people assemble to declare God's kingship over the world, just as all people on earth will assemble at the time of Mashiah to affirm the Almighty's unchallenged authority. Appropriately, then, we recite this chapter of Tehillim on Rosh Hashanah in anticipation of the time when our celebration and proclamation of divine kingship will be joined by all other nations on earth, who will ultimately recognize the truth about the Almighty.